Get Your Name Change Affidavit Easily! Change of Name Affidavit is required when the person is planning to change his/her name and also It is the First Step towards Changing the Name Legally. STEP 1– Make an Affidavit for Change in Name pertaining the valid reasons for Changing/Correcting the name. STEP 2– Newspaper Publication- Publish the advertisement in 2 local Newspaper of your state and preserve the copies of that newspaper in which your statement is published. STEP 3– Publication in Gazette of India – Publish the Notification in Gazette of India about the Name Change with necessary Documents and publication fees. Change of Name of Minor Affidavit is required when parents want to change the name of their son/daughter legally. STEP 1– Make an Affidavit for Change in Name on behalf of Minor Child pertaining the valid reasons for Changing/Correcting the name. Change of Name after Marriage Affidavit is required when the female Applicant willing to Change her surname in the records of Government. STEP 1– Make an Affidavit for Change of Name after Marriage and make it Notarized. STEP 2– Update the Information in the other necessary Documents and also in the Local Municipality Department, Children’s School and at other relevant/important place where the information needs to be updated. Name Correction Affidavit is a Document in which a person give sworn statements/declaration about his real/actual name along with a incorrect name in a particular Document. 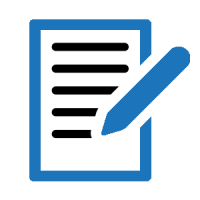 STEP 1– Make an Affidavit for Correction of Name and make it Notarized. 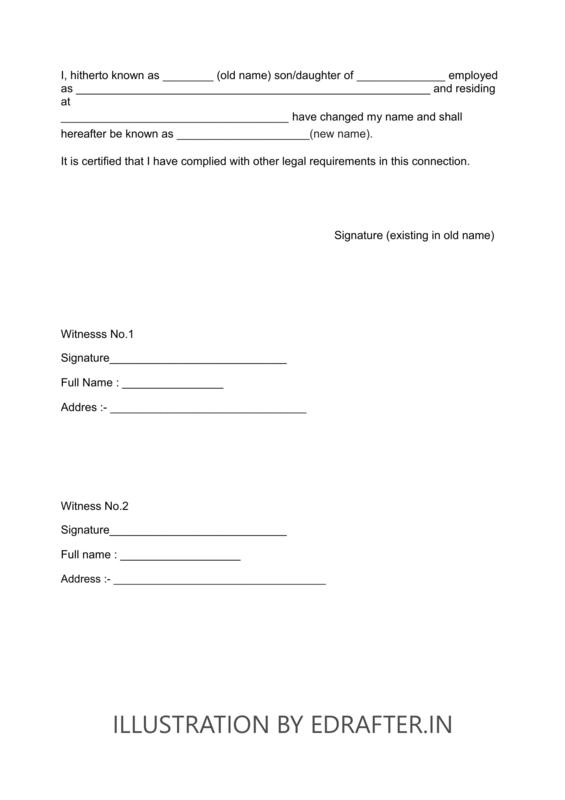 STEP 2– Submit the Affidavit in the concern authorities to get the Name Correct. One and Same person Affidavit is required pertaining that both the Names belong to Same Person. Rajinder Prasad mentioned his name in few Documents as R. Prasad and in few Documents as Rajinder Prasad, So affidavit is required to provide that both the Name belongs to One and the Same Person. You can also avail our Name Change Package Service and we will assist you through out the process to get your Name Changed Legally. What is the eligibility for Changing of Name Legally? Changing Name is very common in India and can be adopt due to various reasons. The eligibility for Changing of Name is just that the applicant should be of 18 years or above. The Minor applicant can also change his/her name but in that case the Parents need to carry out the process on behalf of the Minor Child. How to Create Name Change Affidavit? Draft the Affidavit by providing the details of the old name and new name. Execute the Affidavit on a Stamp Paper of Denomination of Rs. 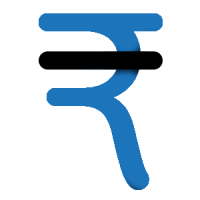 10/- or as per the prescribed stamp duty as per your state. Make the Affidavit attest and sealed by the Notary Public. 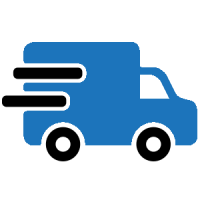 You can avail our service as well and we will carry out these steps on behalf of you and will deliver the Affidavit to you at your place. It will save your Time and Money too. How many types of Name Change Affidavit are there and which one should i avail? 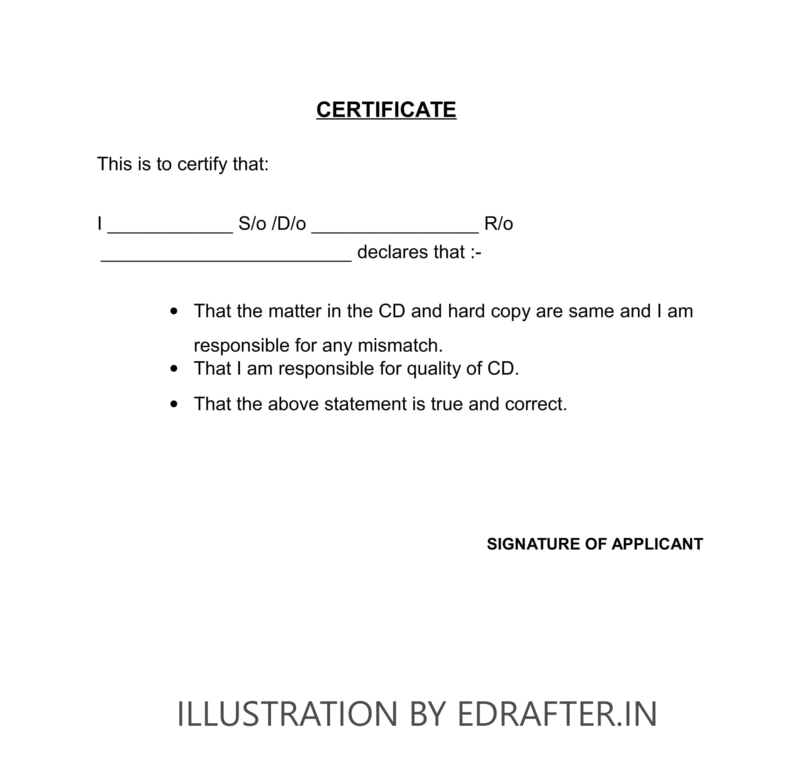 Name Change Affidavit – This Affidavit is use to Change Name Legally in all the Documents and also to publish the Notification in Gazette of India. Name Change after Marriage – This Affidavit can be use by Lady Applicant seeking for changing their maiden name after marriage and publishing the same in other documents. 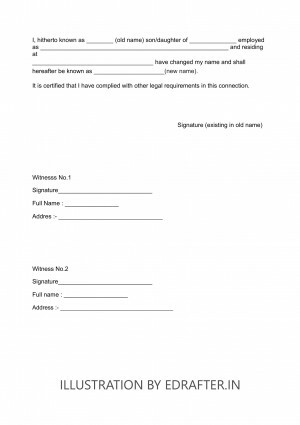 One and the Same Person Affidavit – This Affidavit act as a Multi-Name Affidavit. The Applicant who have different names in the Documents and want to provide the proof that all the names belong to one and the same person in that case the One and the Same person Affidavit can be used and provided. Annexure “D” – Annexure D is use for Name Change of Lady Applicant after marriage in the Passports. So, if you wan tto change your maiden name in Passport then you can opt for Annexure “D” Affidavit. Annexure “E” – Annexure E is use for Name Change in Passport whether minor change or major but if you want to get your name change in Passport then you have to provide the Annexure E Affidavit to the Department. What is the full process of Changing Name legally in India? MAKE NAME CHANGE AFFIDAVIT– Make the Name Change Affidavit on a stamp paper and make it Notarized from the Notary public or from the Magistrate. The Details may include in Affidavit are : Old Name, New Name, Address. Making it Notarize from Notary Public officer will be less time consuming as compare to making it attest from Magistrate. So, it is recommended to get the Name Change Affidavit attest from Notary Public. PUBLISH ADVERTISEMENT IN TWO LOCAL NEWSPAPER – Publish the Advertisement in two local leading newspaper of the State. The Newspaper publication must include the details : Old Name, New Name, Full Address, Date of Affidavit, Name of Notary Public (For Married Applicant the Husband’s Name and Date of Marriage is also required in publication). Provide advertisement in Two Leading Newspapers i.e one in the Regional Language of the native state from where the applicant belong and one in the English leading newspaper and preserve at least 4-5 original copies of the Newspaper. PUBLICATION OF CHANGE OF NAME IN GAZETTE OF INDIA – Publish the Notification in the Gazette India about the Name Change and preserve the copy of notification with you and use it at the places where you want to change your name. Publication in Gazette of India is not mandatory in all the states, it depends upon the State to State, while its mandatory for Government Employees to draft the Name Change Deed and to publish the notification of changing name in Gazette of India. What is the procedure for publication the Notification in Gazette of India? An Undertaking duly signed by the Applicant showing the old and new name and declaring and undertaking the Statements that they are true and correct to the best for his/her knowledge. For Govt. employees working with Central Government will be required to submit Deed for change of name in accordance with the Ministry of Home Affairs 0. M. No. 190016 / 1 / 87-Estt. dated 12/03/1987. In case of Indians who are living abroad, they have to submit deed duly attested by the respective Indian Embassy / Indian High Commission, in original to this Department. A Demand Draft of Rs. 1,100/- in favor of Controller of Publication, Department of Publication, Civil Lines, Delhi – 54. Two Passport Size Photographs pasted on a plain paper along with a new name types on it. One Self Attested Photo ID Proof. Application/Forwarding Letter describing about all the Documents enclosed within the envelope. Note – The enclosed Documents should not be older then one year otherwise it will not be acceptable by the Department of the Publication. How much time the publication in Gazette take? Is it mandatory for Lady applicant to publish advertisement in Newspaper and Notification Publication in Gazette for Name Change after Marriage? No, its not mandatory for Lady Applicant to publish advertisement in Newspaper and Notification in Gazette as well. If the Change is only in surname then there is no need to publish it but if the change is major i.e change in whole name then its important to publish the advertisement in Newspaper and Gazette Notification. STEP 1 – Make an Affidavit for Change of Name after Marriage and make it Notarized. I want an affidavit for name and religion change.